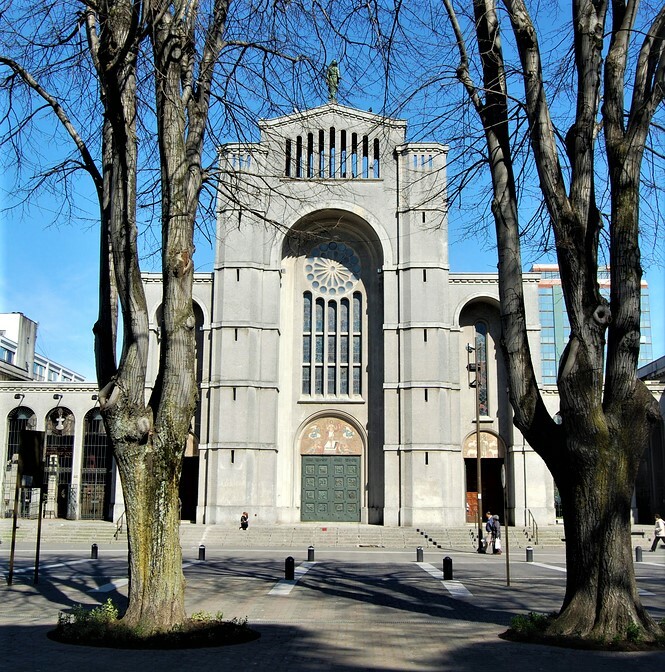 The cathedral stands in calle Caupolicán, between O’Higgins and Barros Arana, opposite the Plaza of Independence. It’s in the neo-romantic style with Byzantine and Modern influences. It’s found next to a suite of Episcopal buildings like the Palacio Arzobispal and the Parroquia del Sagrario. Located at calle Lincoyán 265, on the corner of San Martín. It’s run by the Congregation Dominican Fathers of Concepción. It’s in the neoclassical style of the beginning of the century. This imposing, solid church, with its thick walls, stands on calle San Martín. The façade is flat, with vertical pillars that jut out, revealing a structural modulation of the wall, with little arched openings and decorative pilasters that rise up from the central axis to support a wall that [jerarquiza] an entrance. Located at calle Castellón 624 and is responsible for the Congregation of the Fathers of the Order of Mercy. It was built at the beginning of the 19th Century and was devastated by the earthquakes of 1843 and 1939. Around 1940 the façade was rebuilt, losing some of the size and the ornamentation of the original design, but conserving the huge wooden columns and it’s solid floor on the inside. There is a little porch in front of the main entrance, giving a better look to the building. In 1956 a wooden tower designed by Ernesto Loosli was added, which holds the bell of the parish church. Located at calle Castellón 355. It was built by the architect Jorge Velasco Urzúa. The first church was built in 1786 and subsequently devastated by the earthquake of 1835. The second building was erected in 1863, and was characterized by a tower of 4 sections which could be seen all over the city, but was again destroyed by the earthquake of 1939. Afterwards the church that stands now was built on the same site in this residential area, in the form of a basilica with three naves. Construction started in 1949 and the present church was inaugurated in 1958.